While wearable activity trackers have been commercially available since the 2009 release of the original Fitbit, investments in new technology has evolved these trackers into all-around health monitors. These relatively new devices can go beyond simple pedometer functions of their predecessors by integrating real time bio-analytics. The presence of accelerometers, altimeters, GPS technologies, and heart rate monitors in wristbands and armbands is all but expected with today’s fiercely competitive consumer hardware market; a market which has expanded to include more than 25 different vendors including major players like Apple, Microsoft, Samsung, Sony, LG, Huawei, Garmin, and Fitbit. With such large-scale investments being made in health monitors and their corresponding applications, one logical next step is their adoption into more formalized healthcare institutions such as hospitals and clinics. Equipping patients with health monitors would allow doctors to remotely oversee vital signs and activity levels during treatment sessions, medication administration, and pre/post operations. By syncing this device with a doctor’s computer or tablet, they could even monitor patients who may be recovering at home. These new insights would provide healthcare teams with a more accurate picture of how their patients are responding to treatments or are recovering from procedures. Furthermore, GPS technologies can provide medical staff with real time locations of patients within the institution’s campus, an important feature in larger hospitals that often transfer patients through a wide verity of departments. Looking even further into the future, hospitals could use these wearable medical monitors in place of some more traditional, wired heart rate machines. This would allow healthcare providers to better monitor patient vitals, without them being wired to a COW (computer on wheels) or fixed wall-mounted system. Specifically, this gives doctors and nurses constant sight into vitals even when patients are being moved, are undergoing treatment, or are simply in an area away from the COW or fixed system (in conditions such as a bathroom or water therapy pool). While there is clearly promise for the use of wearable devices in hospitals and clinics, consumer grade wearables face considerable challenges in the medical market. These challenges arrive mainly in the form of security and complicate concerns with federal HIPAA and FDA regulations. 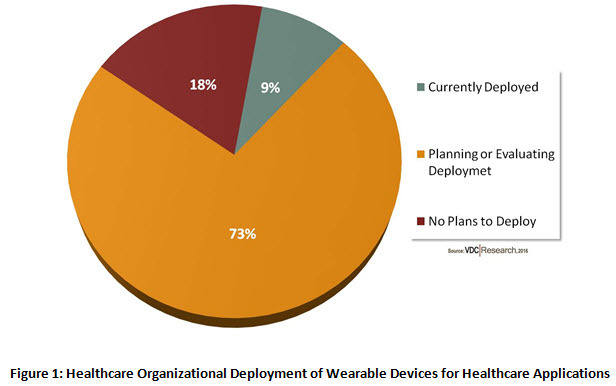 According to a 2015 VDC Research survey (see Figure 1) only 9 percent of healthcare organizations have deployed wearable devices in spite of these regulatory hurdles. Not only do the hardware vendors need to be compliant with regulations, but current policy dictates that any mobile application which may pose a threat or risk to patient safety can also be subject to federal regulation. With wearable health monitors transmitting information protected by these privacy regulations, the entire healthcare IT ecosystem must work collectively to address this daunting and complex barrier before witnessing greater adoption rates. While this seems like an impossible task, Figure 1 does also show a glimmer of good news. Nearly three-quarters of healthcare organizations surveyed are planning to deploy or are evaluating the use of wearable technology for healthcare applications. As a recent 2015 example, the FDA gave Neurometrix, a Massachusetts-based healthcare technology company which develops wearable medical devices, approval to deploy a new pain management device called Quell. Quell is a small device which is attached to the calf and held into place by a washable band. It is then is able to monitor and manage chronic pain via intensive nerve stimulation. Quell was originally piloted at Beth Israel Deaconess Medical Center for the treatment of ailments such as fibromyalgia, arthritis, nerve pain, and sciatica. With more and more healthcare taking place off-site, at assisted living facilities, physical therapy groups, or even at home, significant pressure to adopt advanced wearable technologies is building within the healthcare industry. As more advanced encryption capabilities, remote hardware data wiping, and enclosed communication environments become readily available, expect wearable health monitors and other mobile wearable technologies to better serve the medical community. Cameron Roche is a Research Analyst in VDC’s Enterprise Mobility and Connected Devices practice. His research centers on commercial and consumer grade mobile hardware devices and their enterprise implementation across a wide verity of industries. Cameron received his MA in Political Science from the University of Massachusetts, Amherst. While in graduate school, Cameron’s research specialties were political psychology and advanced survey/polling methodology. Cameron served as the Research Assistant for the National Science Foundation funded Cooperative Congressional Election Study (CCES) and as an Assistant Director of UMass Poll. He also holds an Honors dual BA degree in Psychology and Government & Law from Lafayette College where he served as an EXCEL Research Scholar. 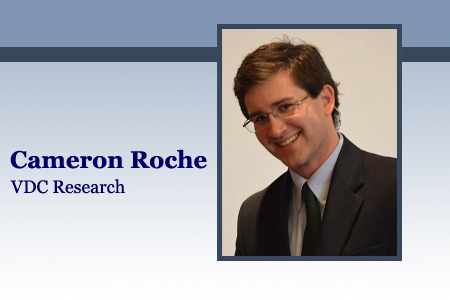 Cameron can be reached at croche@vdcresearch.com or via Twitter @Cam_Roche. For information please contact VDC Research at info@vdcresearch.com.